No more coffee out of paper cups, this Powerpuff Girls mug is gone change that forever. This mug is white and on both sides it has a picture of our favorite Powerpuff Girl Bubbles. And having the picture of Bubbles on both sides is more fun so that you and your friends can both enjoy the Powerpuff Girl. 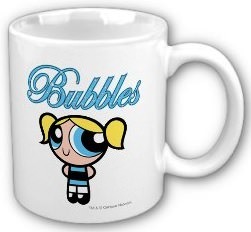 This Powerpuff Girls Bubbles mug comes in two sizes 11 and 15 oz. So select the size your prefer and order your Powerpuff Girls Bubbles Mug.